Sandwiches come is all shapes and sizes, flavors and colors, and textures and temperatures. I've determined I'm a bit of a sandwich snob connoisseur. What do I mean? Well I like a good sandwich. What makes a good sandwich? I guess whatever you like to put on it but it has to be just right. I've tried to make sandwiches at home but they are just okay. I'm not sure what my homemade sandwiches are missing. Might be that cool sandwich station with little containers of assorted toppings to choose from and paper to wrap them in. I have the same problem with my love for Diet Pepsi. I prefer the fountain soda version over a can or bottle. Weird yes, but true. Back to the sandwich. Where do you buy your favorite sandwich? 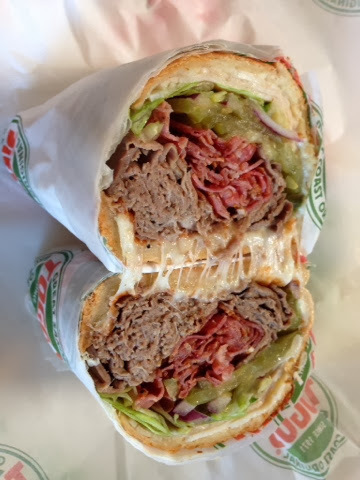 There are lots of local sandwich joints and I have tried them and they are great but I always go back to the one with my favorite sandwich. You see the #24 on wheat has long been my go-to sandwich. This sandwich shop is local to California (and can be found in Oregon and Arizona too) and found in many of the great communities I have been a part of over the years. Togo's is my sandwich shop of choice. This is not something I have shared with probably anyone. Why? Well, no one has ever asked. 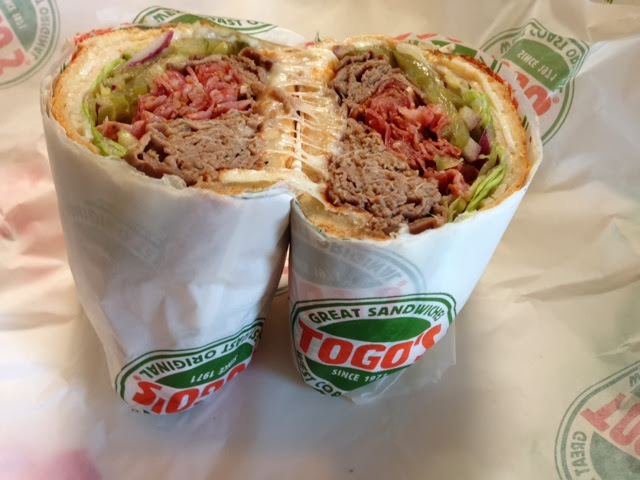 So imagine my surprise when I got an email from Togo's asking me if I might give all of my blog readers my thoughts on a new sandwich on their menu. I said SURE. Are these people watching me? How did they even know I knew where Togo's was? In full disclosure, they offered to even send me a gift card to buy the sandwich. I accepted! What they don't know (until they read this) is that I bought the sandwich and a few others before I got the gift card. And here it is. This particular sandwich is the "Triple Dip" Toasted Dip Sandwich and is one of two new Toasted Dip Sandwiches Togo's is offering right now. This sandwich is loaded! Do you see the melty cheese? Pastrami, Turkey and Roast Beef and it is really good too. I've ordered it twice now, on different occasions of course. I also ordered the "Roast Beef Dip" once which I also highly recommend. Here is what I learned. The "Toasted Dips" don't normally come with veggies. After all they are served hot with a side of dipping juice too. We call this "Au Jus" at home. What do you call it? Each sandwich has provolone cheese and a creamy horseradish mayonnaise. I ordered the sandwich as-is the first time but decided I would "up the ante" the second time. As you can see I added the fresh veggies (lettuce, onion and pickles) and a little extra horseradish mayonnaise too, at no extra cost of course. I couldn't taste the horseradish the first time and I like it so I wanted to be sure to taste it next time and along with the crunch of the cold veggies, was an excellent improvement for my taste buds. The staff at my Chico Togo's on East Avenue are always really great and accommodating. They gave me a little extra horseradish mayo in a cup too. Just in case you know. And I added a Diet Pepsi too. Remember I do like my Diet Pepsi from the soda fountain. So what might I change about the "Triple Dip"? It's a little pricey for a sandwich at $9.95 for a six inch. Yes it does come with 1/2 lb of meat so this is a shareable sandwich in my opinion. I could not eat the whole thing but maybe a big guy like my husband would. The six inch "Roast Beef Dip" was the normal $6.95 and worth ever penny. A great lunch or dinner option. And if you go to their Facebook page right here, they are running a "Toasted Dips" promotion and you can get a coupon for a $1 off. Will I order one of the Toasted Dip's again? Absolutely! I really like these sandwiches. Will I go back and order my favorite #24 on wheat. You bet! What is the #24 on wheat you ask? Well I guess you should head on over to the Togo's website and figure it out. 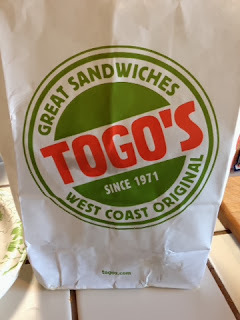 And while you are there, find out if there is a Togo's in your town. You won't be disappoined. 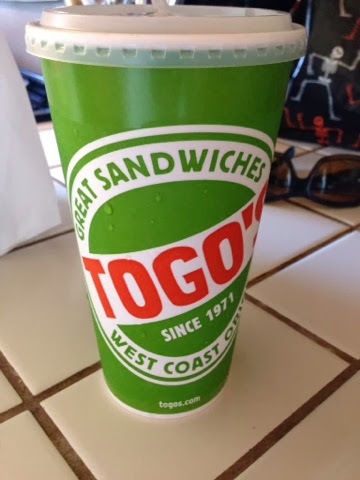 I remember the Togo's next to Chico State when I went there -- that probably dates me as I saw on my last visit to town it was no longer across the street from campus. My go-to was the #23. We have one in the outlet mall where I live but they seem to have a limited menu. I'll have to head back and see if they've expanded it.